Each different type of residence has a specific functionality it needs out of its flooring. A home owner primarily wants flooring that is aesthetically pleasing. An industrial site needs flooring that can withstand the use of heavy machinery. A chemical site needs floors that can handle its products being spilled on them without creating permanent damage. Believe it or not, one type of flooring can serve each of these needs and wants, and serve them well. Epoxy floors are not only beautiful, but they’re practically impervious to any kind of damage. Epoxy is created by mixing resins with hardeners, creating a glue that forms an incredibly strong bond with bare concrete. The enamel will protect the concrete from cracking and staining, increasing the longevity of the base floor while keeping it looking nice, as well. And unlike paint, whether latex or enamel, it will likely never need to be touched up due to wear and tear from regular use. No matter what is spilled on the epoxy, the floor will not be damaged. Epoxy floors can withstand water, salt and chemicals without cracking, chipping or dissolving. Neither will they be weakened from exposure to UV rays. These floors can take whatever abuse comes to them during their lifetime. 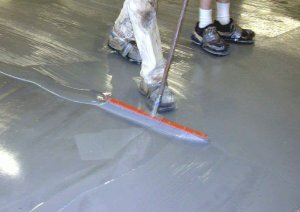 The limited amount of material needed to install epoxy floors makes this type of flooring an extremely economical choice. No special sub-floor needs to be installed over the concrete, and the finished floor will not need regular waxing or other coating to maintain the high-shine finish, making them an easy-to-care-for option, as well. All of these considerations together make epoxy floors a great choice for a garage, whether residential, commercial or industrial. Home owners will appreciate the beauty an epoxy floor adds to their house in addition to the durable finish, and commercial and industrial garage managers will appreciate the extreme functionality of these incredible floors.